Try pouring some wine into a glass. Don’t drink it yet — this is a scientific experiment. When you hold up your glass, you’ll see what look like teardrops running down the sides. These tears of wine are caused by the Marangoni effect, which describes a mass transfer along the surface of two fluid phases caused by surface tension gradients along the interface between the two phases (for example liquid and vapor). The term tears of wine was first coined in 1865 by physicist James Thomson, the brother of Lord Kelvin. Italian physicist Carlo Marangoni later studied the topic for his doctoral research and published his findings in 1865. The Marangoni effect, which causes tears of wine and other phenomena observed in surface chemistry and fluid flow, is named after Marangoni and his research. Tears of wine moving down the inside of the glass. Study your glass. Do you see the tears? If not, it may be because you chose a wine of low alcohol content. If you want to see tears of wine, wine with a high alcohol content is more likely to display tears. Wine with a low alcohol content gives only small variations in alcohol concentration and surface tension along the wine-air interface and will rarely show teardrops. The wine in the photo above has 13.5% alcohol content, which is on the lower side, but high enough to produce tears. Surface tension is a property of the interface between two phases. It describes the amount of energy needed to expand the surface area of that interface by one unit. You can also look at surface tension as the force per unit length needed to create new surface area. The figure below illustrates a liquid phase in contact with its vapor. The surface molecules (shown in red) have only very small upwards interactions with the vapor molecules (shown in orange) causing them to experience asymmetrical force that pulls the surface of the liquid together. The molecules in the bulk of the liquid (blue) interact in all directions. 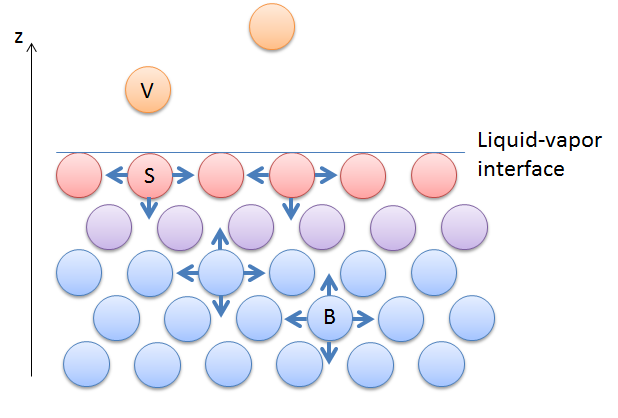 To expand the surface area of the liquid, bulk molecules have to move towards the surface, breaking up upward interactions. Doing so requires energy. Surface tension in a liquid interacting with its vapor. The molecules at the surface (red) experience asymmetric interactions. The molecules just below (violet) experience slightly more symmetric interactions, while the molecules in the bulk (blue) experience even more symmetric interactions. 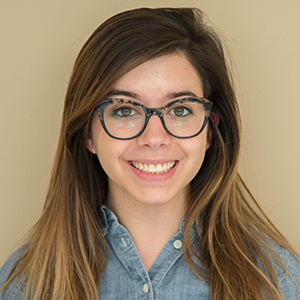 Water has strong interactions in the bulk of the liquid due to its hydrogen bonds, so it has a relatively large surface tension since it requires breaking strong interactions. Liquids-vapor interfaces have surface tensions that depend on the strength of the interactions between the molecules in the bulk of the liquid. The Marangoni effect is the flow caused by gradients in surface tension along the liquid-vapor interface surface in the figure above. Such a gradient can be caused by differences in composition or temperature of the solution along this surface. We can see how this works by pouring a thin layer of water onto a plate and adding glitter or another kind of light material to better illustrate the effect. The interaction between the water and the glitter is due to the glitter particles being hydrophilic, or water loving. Adding a drop of soapy solution, alcohol, motor oil, or any liquid with a contrasting surface tension to the center of the surface causes all of the glitter to immediately rush to the sides of the surface, away from the center. As you pour soap, the soap molecules form a thin film — only one or a few molecules thick — on the water surface. The surface experiences a difference in surface tension between the parts covered by soap and the parts with only water, which causes the soap film to spread and the glitter particles to flow to the sides — the Marangoni effect. 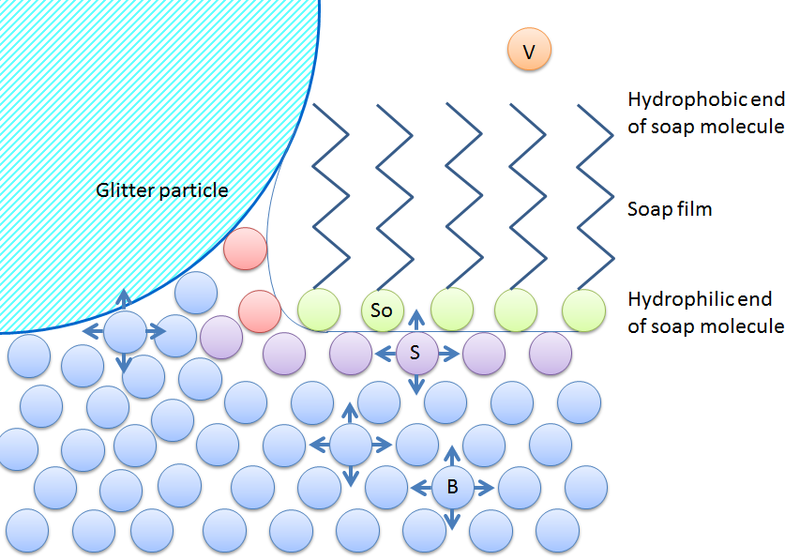 Eventually, the soap molecules cover the whole surface, which lowers the surface energy, because now the surface water molecules are also able to interact with the hydrophilic end of the soap molecules. In the next figure, the experiment is illustrated on a molecular level. The glitter particles rather interact with water, not with soap, because they have a hydrophilic surface. They are squeezed to the sides as the soap covers the surface because they “want” to continue interacting with water molecules. Surface tension changes as soap is added to water. Soap is green, an ion with with a hydrocarbon “tail”. Water is blue in the bulk, red at the free water surface, and violet at the surface covered by soap or when they are just below other surface water molecules. In tears of wine, a meniscus forms at the three-phase junction between the wine glass walls, wine, and air. This is where the liquid loosely clings to the surface of the glass. The meniscus is formed because the walls of the glass have a hydrophilic surface, like the surface of the glitter particles. Wine contains alcohol that is continuously evaporating from the surface at a rate higher than water (since ethanol has a higher equilibrium vapor pressure than water), and this also takes place in the meniscus. The alcohol concentration decreases faster in the meniscus due to its higher surface area in relation to its small volume. Therefore, it causes an alcohol concentration difference between the meniscus and the flat interface surface between the wine and air. This then causes a surface tension gradient that moves the meniscus up the walls of the glass. As the meniscus begins to form a film on the surface of the glass’ walls, it gets even more depleted of alcohol, which in turn causes a larger surface tension gradient. More wine gets pulled up the walls of the glass until droplets form. Gravity takes effect and tears of wine run down the sides of the glass and back into the bulk of the wine. 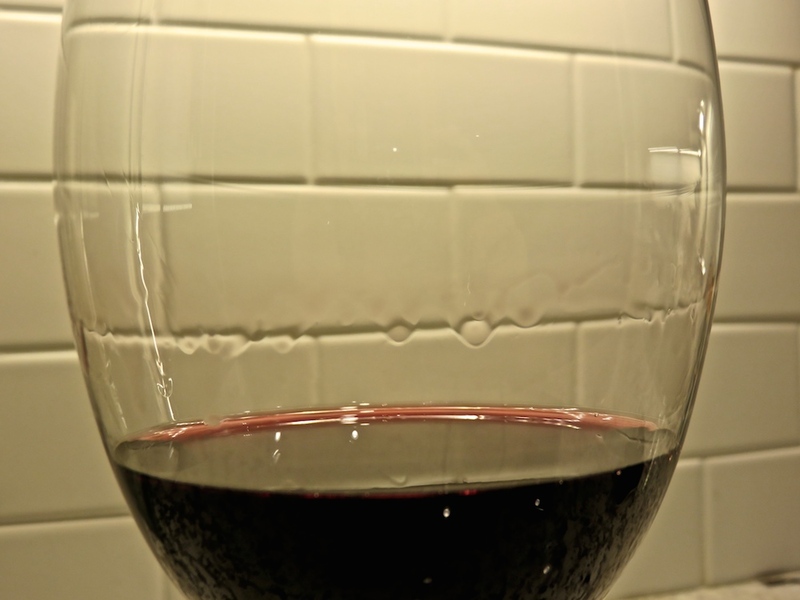 Tears of wine form due to the surface tension (γ) gradient between the meniscus and the flat surface of the wine. 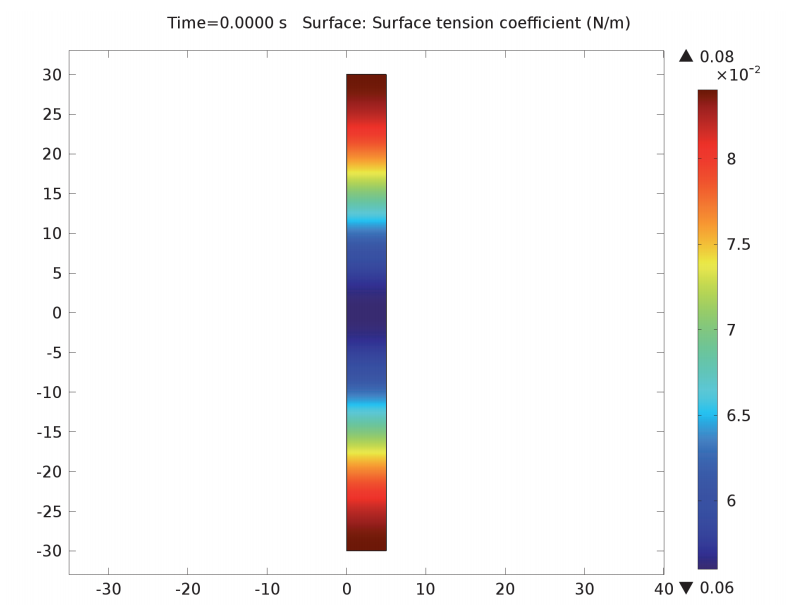 We can model the Marangoni effect with COMSOL Multiphysics and the Microfluidics Module. To get started, we have a tutorial model that illustrates the concept — the Jet Instability model. This model simulates an inkjet printer and the breakup of an infinitely long liquid jet due to a spatially varying surface tension coefficient. There are three ways to solve this model: via the moving mesh, level set, or phase field methods. If you go to the Application Gallery, you will find PDFs with modeling instructions for two of these (the moving mesh and level set methods). The moving mesh method is faster and easier to use than the level set method, as we saw in Fabrice Schlegel’s blog post Which Multiphase Flow Interface Should I Use? However, we can only use the moving mesh method to model the Marangoni effect in tears of wine if the wine layer on the side of the glass has a definite thickness. There can be no dry area between the tears and the rest of the wine. If that’s the case, we must use either the level set or the phase field method. The Jet Instability model consists of a fluid domain in the shape of a cylinder with a radius of 20 microns and a height of 60 microns. The domain contains a cylinder of water with a radius of 5 microns. We need to define the ink properties such as density and dynamic viscosity, as well as the surface tension coefficient. We use the Laminar Two-Phase Flow, Moving Mesh interface to solve the model, which is plotted on moving mesh geometry. 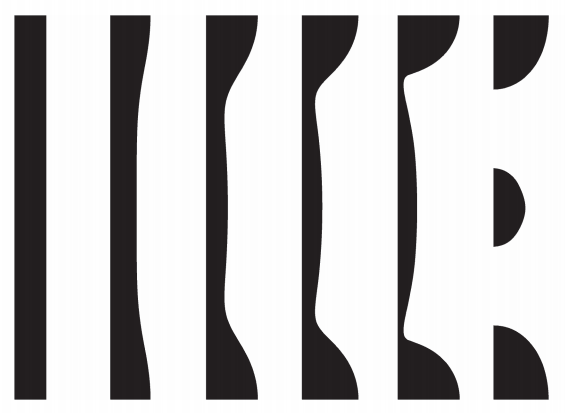 For this simulation, the interface has no thickness and is represented by a boundary. This is better for practical mesh densities. The interface calculates the Navier-Stokes equations and boundary conditions and transforms it onto a fixed mesh. A cylinder of an inkjet printer in the Jet Instability model. The Laminar Two-Phase Flow, Moving Mesh interface can easily input other physics and it is faster and more accurate than the level set and phase field methods. However, the moving mesh method cannot handle topological changes. This means that it can only be used for calculations prior to the breakup of droplets. The Laminar Two-Phase Flow, Level Set interface calculates velocity field and pressure as described by the Navier-Stokes equations, periodic boundary conditions, and point settings. The results below were modeled using the level set method and show the breakup of the jet into droplets over six time periods. At first, the liquid forms a perfect column, but the variation in surface tension disturbs the jet and causes a force due to surface curvature that eventually breaks up the jet into droplets. The liquid regions of the model as the jet breaks up due to surface tension variation over space (shown at six different times).